Aruba holidays take you to the ultimate hideaway. Less than twenty miles long and six miles wide, this flat island is renowned for its beaches. Lying fifteen miles north of Venezuela, this tropical island is reminiscent of a desert island film set. Located outside the hurricane belt, you can take a cheap Aruba holiday at any time of year. With a constant temperature around thirty and an annual rainfall of only twenty inches, you can be sure of good weather through all seasons. The superfine pale sandy beaches, so loved by tourists, are found in the south and west of the island. There are plenty to choose from. Here the seas are a fantastic shade of blue and offer safe bathing. To the north, the coastline is mostly rocky and the seas are heavy with strong currents. Experienced surfers can enjoy conditions here, but novices should be supervised. Divers will be delighted, not only by the variety of marine life but by the historic wrecks that lie in their watery graves. Although most recreational activities involve the sea, visitors can also enjoy horseback rides along the beaches, jeep safaris, cycling tours, or simply hiking. 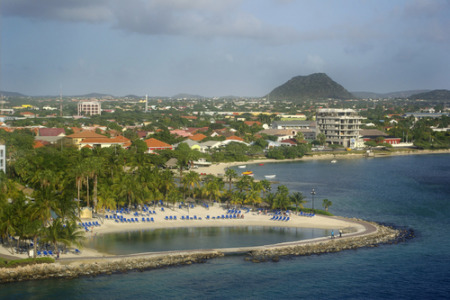 Since tourism is the main source of income on the island, Aruba holidays are designed to please. Standards of accommodation are high and service is second to none. You'll find that nothing is too much trouble for the locals. Restaurants are many and the menus are diverse. Perhaps because the island caters for US tourists, you may be surprised to find a number of fast food outlets. While Aruba is no shopping mecca, there are plenty of opportunities to buy gifts and souvenirs as well as fashion goods in the malls. Essentially, cheap Aruba holidays are all about its main attraction, superb beaches and guaranteed sunshine. Look out for the distinctive Divi Tree with its curved trunk, caused by prevailing easterly winds. If you find the allure of a cheap Aruba holiday irresistible and you wish to avoid the tiresome task of trawling through web page after web page trying to find the best deal, try our simple search facility. You'll find over three dozen travel companies competing for your custom. It is simple to use and remember, competition brings out the best bargains. Our search facility enables you to see, at a glance, the Aruba holiday that is the cheapest and the one that offers the best value for money. All you have to do to secure the holiday is make a phone call. To book the best deal, and to avoid disappointment, ring today.